In-freezer ice makers are inexpensive. It's not always economical to repair them after 6 to 8 years of use. We may recommend replacing the unit rather than repairing it. If you need assistance with your ice maker, call us at (506) 872-9956 or make your request on our Contact Us page and an ice maker repairman will assist you. It may be turned off. Check the ice maker shutoff arm located at the top of the ice bin. Look for the wire along the right side of the ice maker that looks a bit like a coat hanger. If the wire is in the raised position, the ice maker is turned off. If so, simply lower the wire. Is there water in the ice cube tray? If not check for water to the water valve. If you have water then it could be either a failed fill valve or ice maker control module is not activating the water valve. Check for pinched water supply line (behind the fridge). Do you have an inline water filter? If so, when was it changed last? To test if it is plugged, check for water both before and after the filter system. Sometimes the water inlet tube that directs water into the ice cube tray freezes over; this can often be thawed out by simply using a hair blow dryer and warming the area (be careful not to overheat the plastics as they can warp or crack). Then adjust the freezer to a slightly warmer setting and make sure water is not constantly dripping from the inlet tube, as it will only freeze over again. If it continues to drip, we may need to replace the water control valve. The ice maker head assembly may have broken parts. Look to see if the gears are broken. Check to see if the small plastic arms that rest against the ice rake are broken. Your freezer temperature is not cold enough, inspect for hardness of frozen foods. Make sure that the temperature is -13 degrees Celsius or lower. Carefully feel the sides of the icemaker if it is warm the unit is stuck in heat for release mode. We need to replace the control module; please contact us for help. Some older design ice makers used flat clear PLASTIC ice cube tray that twisted to release cubes. If this is your design, the trays often can build up with minerals from the water supply and eventually become sticky and fail to drop the cubes. To test you can remove the ice cubes stuck in the tray, then try spraying the tray with PAM or grease it with margarine and let it run a cycle, allow a few hours. If the new batch of cubes released from the tray, replace the tray. If they didn't then your problem is with the ice maker module, it may not be advancing. Other design ice makers use a small heating element to slightly preheat the ice cubes prior to sweeping them into the ice bin. These heating elements rarely fail; more often it is the thermostat or control module. The ice maker mold thermostat could not switch the heater on, make sure that it's cycling properly. The water-inlet valve may not open properly, we need to replace it. We can perform a test on the each element to double check, please contact us. You may need a new water filter. The water line that's attached to the back of the refrigerator may be clogged. Make sure you have good water flow. If the flow is poor, repair, clean, or replace the tubing or the shut-off valve that supplies the water. Check that both the fridge and ice maker are sitting level. Often the result of food odor or flavor transfer, remove any old food items from the freezer or fridge compartment. 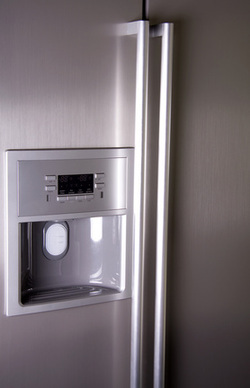 Wash all interior surfaces of the freezer and fridge compartment with vinegar and water solution then dry. Dump the ice bin and start fresh.